So called because it was the kind and generous Roobeedoo who immediately sent me her copy of McCall 6245 to trace, after I lusted after it on this blog post. I made a muslin from the pattern beforehand and it seemed to be a good fit, so I steamed straight in and started hacking away at my precious Liberty Rocks fabric. This fabric was designed for Liberty by ex-Stone Roses guitarist John Squire, and I just love it. I'm always drawn to mid-century geometric patterns and this has all the elements of a 1950's print, yet manages to maintain a modern look too. It was also my first time working with Liberty Tana Lawn. Oooh it's lovely! Buttery and silky to the touch and it barely frays. That didn't stop me overlocking every seam I could get my hands on, just because I could. The pattern, which dates from the early 1950's, reminds me a little of the Colette Patterns Sencha…. but better in my opinion! Unlike the Sencha, it has separate sleeves rather than short kimono ones, and the neckline is lower and prettier with a very flattering triangular keyhole. Then there are the darts …..I think the darts really make the pattern and show just how cleverly constructed it is. As Roobeedoo pointed out here, the placement of two sets of double contour darts at the waist give you curves, even if you don't have any to start with! And if you do have curves (as I do), then the dart placement simply makes them trimmer and more shapely. All very, very clever. Making this top was an interesting exercise size-wise too. In ready to wear clothes, I'm usually a UK size 12. 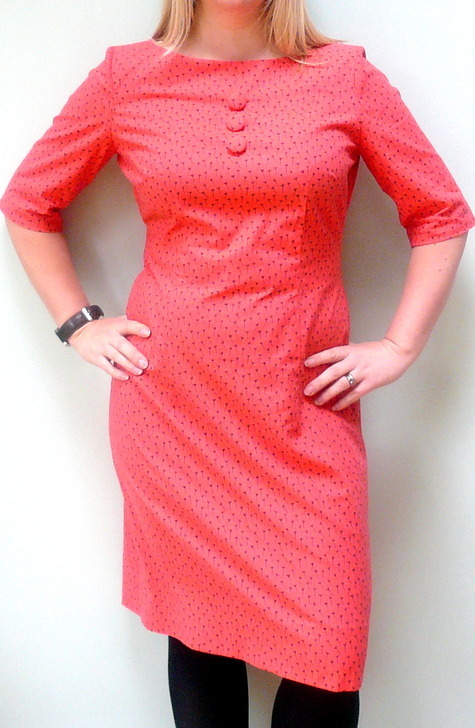 I made no adjustments to this pattern - it's a perfect fit - yet it's a size 18…..fascinating to see just how much smaller women were in the 1950's compared to now. I used to get very hung up about sizing, but now that I've been sewing for a while, I don’t even think about it. As somebody once commented on another blog (can't remember which), sewing makes the numbers on a tape measure become meaningless. Never a truer word was spoken…. Anyway, back to the pattern. 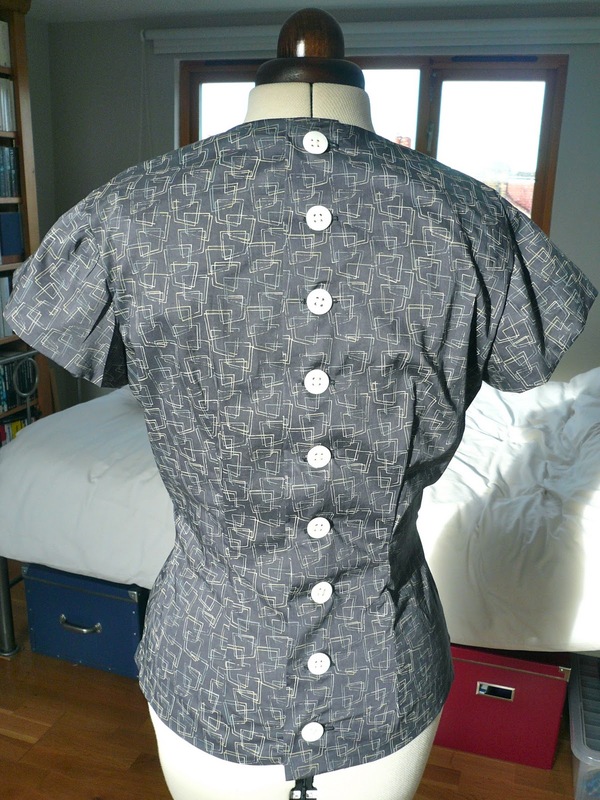 It was actually quite handy that McCall 6245 is so similar to the Colette Sencha pattern - when one instruction for the back buttoned section was beginning to fox me, I simply looked in the Sencha instructions instead and it all made perfect sense! Testament to Sarai's pattern writing skills there I think. Talking of buttons up the back, do you like mine? I used real shell vintage ones that I've been saving for just the right make. I like the fact that this top has both a vintage and a modern look. You can wear it with a vintage skirt or with jeans and I think it works well with both. Thank you so much Roobeedoo, I've now got a top that I love, which I wouldn't have had the opportunity to make without you. As a final nod to Roo, you may be interested to know that I'm wearing a Rockalily lipstick in Rockette Red, as recommended by the good lady herself. 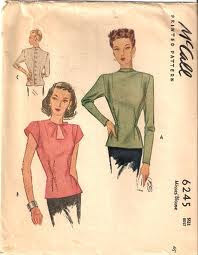 I'm sure you've all read about the latest Sewaholic pattern to be released - The Renfrew Top. I'm more excited than most because I was one of the lucky pattern testers, hooray! It's wonderful to see it in its published state and I can guarantee you won't be disappointed. In her pre-sew guidelines, Tasia advised us to choose a stable knit with less than 5% spandex. As Karen pointed out in her post on the Renfrew (cowl necked, three quarter sleeves and gorgeous - read all about it here), it's difficult to know how much spandex is in a knit or jersey fabric just by looking at it, and very few fabrics in shops or markets have the stretch content listed. Because I wanted to do well for teacher/Tasia, I bought my fabric online from Calico Laine (double knit in 'petrol'), which helpfully lists the spandex content. Ditto Fabrics has a good choice too. So how was it for me? Well I've only sewn with a Sewaholic pattern once before - the Pendrell blouse - but I liked it so much I made it three times. The Renfrew is just as well drafted, and the instructions are super clear and easy. Everything makes sense and the cuffs and waistband sections are a lovely touch that gives the top a professional finish. Because I was still too much of a scaredy cat at this point, I chickened out of using my overlocker and sewed it on a normal sewing machine. 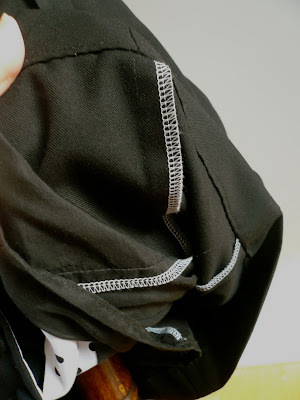 I told myself Tasia needed valuable feedback from non overlocker users.... For those of you without overlockers out there, you'll be pleased to know that it sews up like a dream. I used a simple straight stitch throughout and a quick zigzag on the neckline. And very satisfying and quick to sew together it was too, it only took a couple of hours from start to finish. Size-wise I cut a Sewaholic size 10 and made the same small hip adjustment I made to my Pendrell blouse. The fit is good - snug without being too clingy. 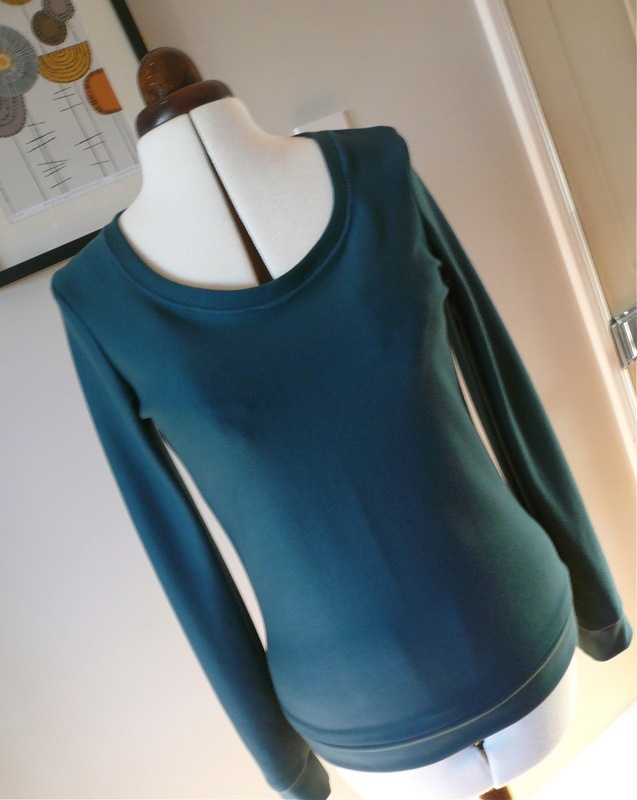 Double knit is quite a thick fabric and with the cuffs and waistband, I initially thought the finished top looked a bit sweat-shirty. I was also worried that the style was too casual. Sometimes though, initial thoughts turn out to be wrong. The double knit is flattering without clinging to every lump and bump like some knit fabrics do and it's SSOO cosy and warm. This is a perfect top for layering and it seems to blend in with whatever you're wearing, be that jeans or a skirt. 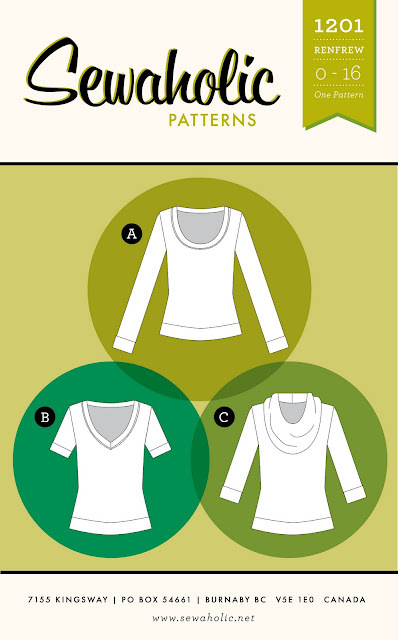 The Renfrew pattern was given to me free of charge for pattern testing. All views my own. 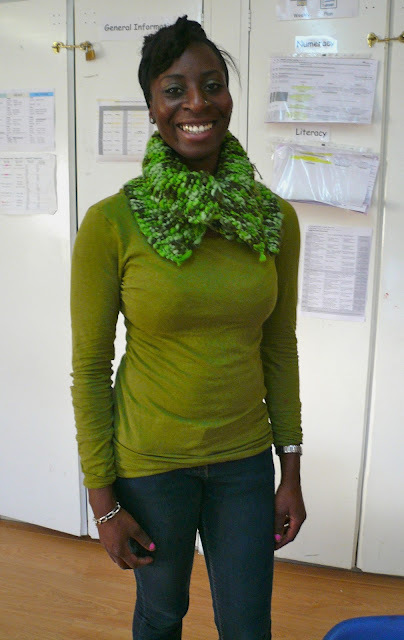 When I first sported my snood in public, it was immediately commented on by Linda, one of my son's teaching assistants. Linda is a wonderful woman, not only does she do an amazing job teaching my son, but she happens to be pretty nifty with the knitting needles too. Very impressively, she identified the wool (sorry, yarn) my snood was made from, just by looking at it! I passed on the free pattern for her to try, and the rest as they say, is history. Look at the result, doesn't she look gorgeous? 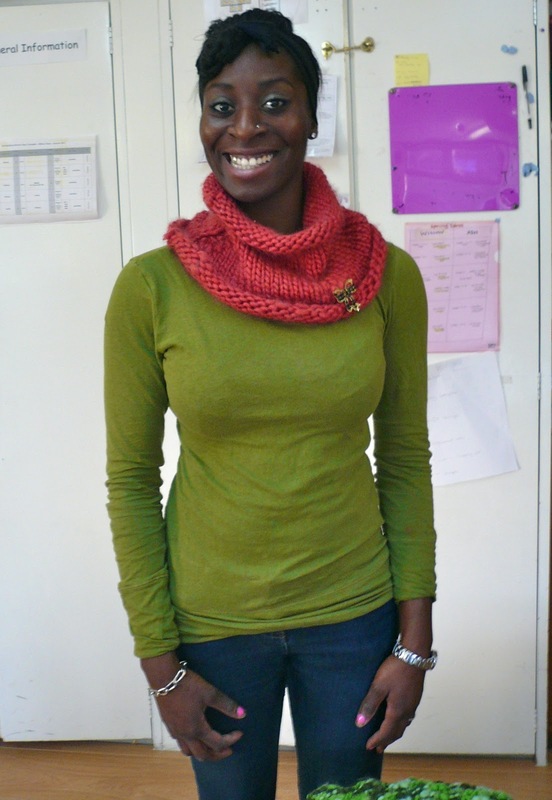 Inspired by the free snood pattern, she even made up her own-design snood in her knitting class: a knitted rectangle that fastens with a button. Sometimes the simplest things are the most effective. Not sure if a black and white version makes it better or worse? 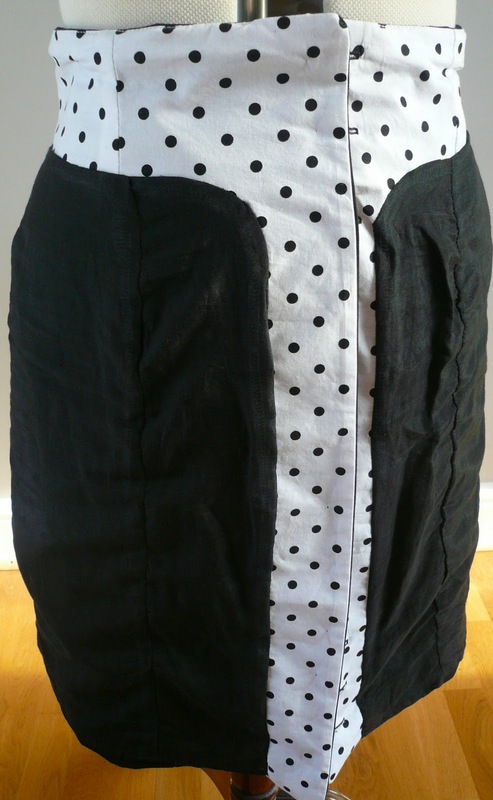 I used gabardine for the main skirt and covered buttons, and silk cotton for the lining. 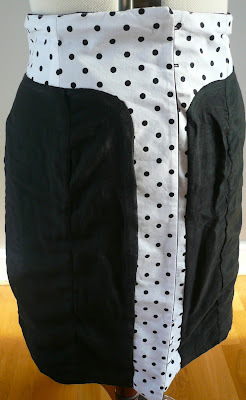 Gabardine is great to sew with and the perfect weight for this skirt. 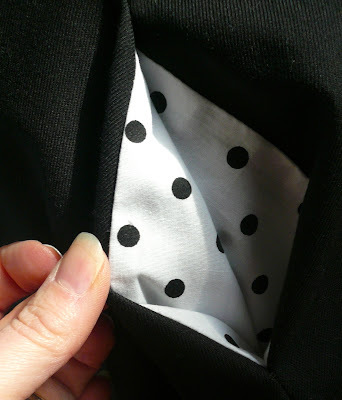 One thing I love about my original Beignet is the contrast polka dot facings and pockets. Why fiddle with something when it's already perfect, I asked myself? So this one is also polka dot faced and pocketed. In my defence, I managed to stash bust the last of the fabric from my Violet blouse at the same time, which is good. I picked up the silk cotton lining on my visit to the Goldhawk Road with Suzie, Alana and Gail last week. Yet another good thing about meeting up with fellow sewists is that they can lure you towards previously dismissed fabrics. After my last encounter with silk lining, I was steering well clear of anything with silk in the title. But Alana assured me that it sewed up like a dream so I went for it. She was absolutely right, it really behaves itself and at £4 a metre (from Classic Textiles, on the left as you go in the door if you're interested) it's a lovely, affordable alternative to standard lining. The pattern is so clever - I particularly like the way the lining and facing keep everything neat and out of sight. Sewing the two opposite curves of the lining and facing together is a true test of sanity though - my only advice would be to do exactly what the pattern says. You may think you know better (as I did) but in the end the steps in the pattern do make it easier. And finally, I wrestled with my overlocker and managed to overlock all the seams. Overlocked seams - aren't they gorgeous? One of my goals for this year is to pass on makes, patterns, fabrics etc that either just don't work for me for one reason or another or that I've finished with. Instead of hanging on to them, I'd like to see them have a new lease of life with a shiny new owner. So that's the theme of my giveaway, hopefully there will be something in here that floats your boat. 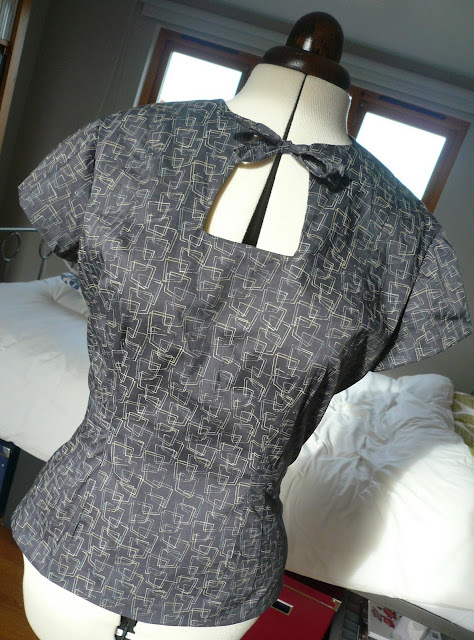 First is my McCall's 2401 dress, which I made when I was taking my dressmaking course. It's a lovely, simple style, but as I bemoaned in this post, it just seems to slip through the net for me when it comes to actually wearing it. It's made from a quilting weight cotton which is a Liberty design, reissued for the V & A Quilting Exhibition in 2010. It's a McCall's size 14, measurements from the back of the pattern being: 36in bust, 28in waist and 38in hips. I took it in a tiny bit at the sides, but apart from that it's sewn up straight from the pattern. The fabric has been washed once prior to making, and the dress has never been worn. For this part of the giveaway, I'll also chuck in the rest of the fabric (roughly 57in wide x 19in high) and four covered buttons. The buttons were originally attached to the front of the dress but have since been snipped off. Second up is Simplicity 6298 - a fab Go-Go boot-wearing dress pattern from 1965. Yeah baby! The pattern is a size 14, 34 inch bust. 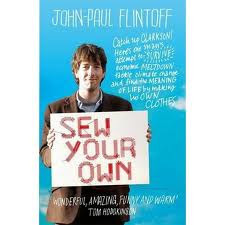 Finally, I'd like to offer my copy of this awesome book to one of my readers: Sew Your Own by Jean-Paul Flintoff. To enter, just leave a comment after this post stating which part of the giveaway you're interested in (you're more than welcome to enter all three parts). The giveaway is open worldwide and closes at midnight GMT on Wednesday 11th January. The winner will be chosen at random after this date and notified by e-mail.